Fashion Asia: Shopping is no fun when you're preggers....but online shopping is!! Shopping is no fun when you're preggers....but online shopping is!! Well, I never thought i would say this. But i totally dread and hate shopping now!! gasp!! hehe.....thats because when you enter your 8th month of pregnancy, you start to waddle when you walk.... Walking for 10 minutes can be so tiring......short of breathe, sore back, tired feet, thirsty.....u name it....NOT FUN! haha......so thank God for online butiques. They are the gem of the era! So i finally succumb to my eye-feast and ordered some stuffs and i am totally happy and satisfied with my purchases because they are stuffs that i've been coveting. 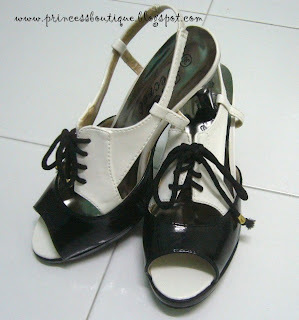 1st off, i ordered my very first Oxford sandals from princessboutique!! Its black and white. And oh so gorgeous. I bought the last piece in my size! im so proud of myself. hehe. RM59+RM6 pos laju. I think its well worth it. eeee.....so beautiful right???? BCBG inspired. Secondly, im pretty proud of myself that i manage to score this from honeypumpkin. If you are one of those that frequent online boutiques. Im sure you've heard of them. Boy i "hate" honeypumkin site!!! hehe.....their items are always sold out!! like.....totally snaped up nomatter what she post up! i often find myself drooling over the stuffs and sulk that it is sold-out or non-restockable. But baby luck must be on my side!!!! i manage to grab the last piece of gladiators in my size!!!! its so stretchable and comfy that i can even wear this at my current size. hehe. happy happy!